So disappointing. Especially when I was so excited to see it... Yet somehow this movie won an Oscar for it's musical score AND was nominated for best picture. Fascinating. I am giving it one star for good singing. I suppose I will probably watch it again, because I own the Gene Kelly/Frank Sinatra box set, but Take Me Out to the Ball Game and On The Town will get many more viewings than this one. 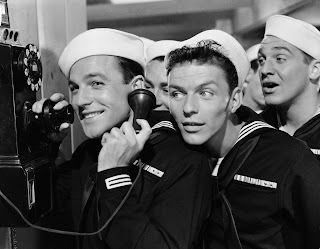 Joe (Gene Kelly) and Clarence (Frank Sinatra) are on a four day leave from the navy. As usual, Kelly plays the womanizer and Sinatra plays his naive but adorable follower. 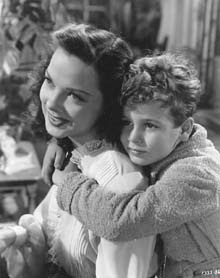 Joe is trying to meet up with a mysterious Lola to make the most of his four days on shore, but is foiled first by Clarence following him to try to learn how to get a girl and second by a little boy (Donald Martin) who has run away from home to join the navy. Joe and Clarence are roped into bringing the boy home, where they meet Aunt Susan... the love interest. Fun Science Fiction Fact: David was all excited that the little boy is played by Dean Stockwell, Al from Quantum Leap. We spent a little while rewinding trying to recognize his face. Also please note that this is the second movie I have seen so far this year in which an actor cavorts with Jerry the mouse. 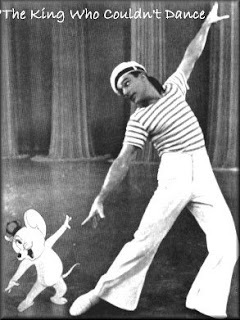 Gene Kelly just had to get a really odd dance sequence into this movie somewhere. Oh yeah that's TOTALLY Al! Where's Iggy?